Refight the first day of Gettysburg with this amazing Officially Licensed terrain mat brought to you by Cigar Box Battle and Osprey Publishing. 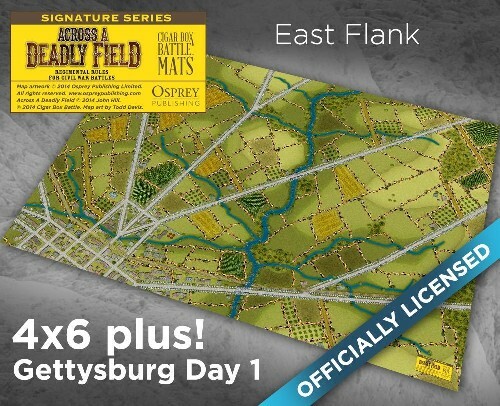 This mat allows the "Across A Deadly Field" gamer to recreate the fighting on the first day from the town of Gettysburg to the east, including Barlow's Knoll, Rock Creek, the York Pike, Heidlesburg Road, Hunterstown Road, and the Carlisle Road. This mat is the actual artwork from "The War in the East" scenario book, and was designed by Todd Davis and the author, John Hill. It includes all historical terrain including printed fences, woods, creeks, and buildings. It plays great "as is", but could also be layered with 3D woods and buildings for an even more impressive look. We recommend this mat for use with 10mm, 15mm and 20mm figures.